In a letter sent last night, the Director of the Idaho State Liquor Division agreed to lift the ban on special orders of Five Wives Vodka after barring sales of the product by Ogden’s Own Distillery as offensive to Mormons. In the letter below, John Anderson apologizes for his past statements and those of his agency in an effort to avoid the litigation announced by my office earlier. We will be watching the reconsideration of the general listing application closely in July. We will keep the team intact during this period. In the meantime, bars in Idaho can order the product through special orders — an inconvenient but hopefully a temporary process. I am in receipt of correspondence from Jonathan Turley, counsel to Ogden␣s Own. The Idaho State Liquor Division shares a desire to avoid unnecessary litigation costs to Ogden␣s Own and the people of Idaho. In this spirit and with that intent, the Idaho State Liquor Division (ISLD) will immediately begin accepting and processing special order requests for the “Five Wives Vodka” brand. 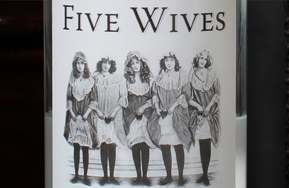 I apologize for comments reported in the media that may have led consumers to believe “Five Wives” is an inferior vodka product. The letter also states that the ISLD is prepared to reconsider general listing for the vodka in the next meeting with brokers in July. Ogden’s own Distillery is pleased Idaho has taken the route to allow Five Wives Vodka into the state via special orders. With special orders, Idaho will be allowing consumers to make their own choice as to what they want to buy and what they find offensive. Though we won’t be on the liquor store shelves just yet, we feel it should be only a matter of time as we will trust that the liquor division will base the decision on demand when we re-apply for general listing. We are very thankful for the tremendous support we have received from around the world and especially from the citizens of Idaho. We’d also like to thank Jonathan Turley and his team for helping to bring this to a quick and proper resolution without the waste of taxpayer money. We also appreciate and accept the apology provide by Jeff Anderson regarding the remarks he made regarding our product. In the end, this dispute was about freedom of speech and consumer choice. We feel that both are in a little better position today in the state of Idaho. For my part, I commend Mr. Anderson and the Attorney General for taking this corrective action and avoiding the need to litigate this matter. Admitting error is not an easy thing to do in a public controversy but it was the right thing to do not just for Ogden’s Own but the people of Idaho. I would also hope that the decision will reaffirm the principles of free speech and free enterprise in Idaho. Citizens in Idaho said that they wanted to try Five Wives Vodka and bars in Idaho said that they wanted to sell the product. They will now be allowed to make those decisions for themselves. In preparing this lawsuit, we were always respectful of the views of Mormons and others who might find the title of the product offensive (though many failed to see an objective basis for any offense). However, we live in a diverse and pluralistic society. For most citizens, there are products or statements in society that may be offensive or insulting. Indeed, some religions find whole products to be offensive from types of meat to forms of expression. We are left to make our own choices on what we buy and what we try in this marketplace of ideas. The power claimed by the state in this case was not just unconstitutional but dangerous. The state insisted that it could bar a product (and speech) on its sole discretion to protect the sensibilities of any segment of the population. A wide array of products and statements in society could be barred on such a slippery slope. The decision to reverse the actions taken against Ogden’s Own is a legitimate basis for celebration. It is particularly fortuitous that the very object of this particular first amendment fight can be used to celebrate its protection. Of course, as a lawyer of Irish heritage, fighting for both free speech and alcohol brought everything I hold dear together in one case. I will be opening my bottle of Five Wives Vodka tonight and enjoy the clean (and reasonably priced) taste of freedom. Congratulations to the fine people at Ogden’s Own. Many a civil libertarian will be lifting a glass tonight in your honor. Steve Conlin – As editor of an online newspaper, I published an article about this story. A little different from most media stories as my research went far beyond your press release. I read hundreds of articles on the story, as well as reader comments. At the beginning of my reading, my opinions stood firmly on the side of Ogden’s Own, but with continued reading I started gathering puzzle peices that were revealing a different picture. I would be interested to see your opinion of my organizations coverage of the story. Our website is eastidahoflame.com if you are interested in reading. Kerry – Yes, we released a press release that is available on our website. Basically stating we were dumbfounded as to why Idaho would not allow special orders and that because of it we would have to cancel some sponsorships. You did go to the media with the story then? idealist707 – We didn’t even start the controversy. It started when a bar in Idaho followed their regular procedure to do a special order of a product. When the state denied that special order we acted. Were we smart to offer t-shirts? Yes. We ordered a whopping 84 of them thinking this story wouldn’t leave the Wasatch front. It truly grew well beyond that. I think the media and public was/is fascinated by stuff that seems quite absurd … such as the issue of our label. For us, this wasn’t a stunt or a joke. We’re a business with 4 full-time employees trying to make it against the big boys out there. It’s not an easy task and the last thing we need are state governments working against us as well. The unanticipated publicity was great, and if I could construct such a reaction, that would be great. But in this case, all we did was tell the truth about what was going on and it took on a life of its own. The people of Idaho and Utah thank you. Most appreciated. BTW, Congratulations Professor. Can you strengthen our rights in significant ways, I mean fighting exceeding specific powers, like murder of persons through executive decision? This victory reminded me of a good PR stunt. Ever suspicious. Usually pays off. says Obama. Losing your cherry and having your first drunk and hangover seem to be eternal rites of passage. There were earlier a lot of aching heads and more this weekend as graduating classes celebrate. The latter are of legal age. Point: It aln’t always better over here. Good luck. I bought my first pint (I was long) at 14 from the ABC store. Mike A, Right! Free Jesus’ wives from misogynistic Pope and his collaborators. Congratulations Professor and Mr. Conlin! This was a good interim decision but it is prudent to keep the legal team together for the hearing in July; it ain’t over ’till it’s over. bettykath, I agree. I think the professor’s next move should be to take on the Vatican in its misogynistic attacks on nuns. For more information, visit the Help Center. If you think you’re seeing this by mistake, please let us know.